This is one of my favorite stitches. We have been working on some new rugs and I decided to use this stitch for the edges. It works so well, and gets the thickness off to a great start. So I wondered how many others were finding this stitch to be a great one for a nice tight edge. 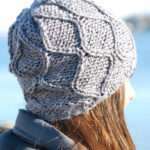 Sometimes the edges seem to be what ‘befuddles’ many new knitters. So, I thought I should talk about it since it sounds complicated to describe, but really isn’t–and it is a lot of fun. It is one stitch that does not do a full circular, only one pass of the board. 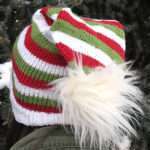 It weaves across the two rows of needles at an angle of needle 1 to needle 3. Every needle gets covered. The tricky part of it is, at the beginning of a row and at the end. Because we are weaving needles 1 to needle 3, we have some bare needles and need to cover them. So we do this by first weaving the first 3 needles and then starting the diagonal weave. Same at the end of the row, we cover the bare needles by weaving the last 3 front to back. So, some overlap occurs and that is where we get the thick and thin issues. So, what thoughts or questions are there for this stitch. It’s not hard, just confusing when you first start it, but I think its worth the effort. The Zig Zag Stitch is on the bottom of the vest, the last three stitches. It really is a great finishing stitch. I have a quick question. I understand how to wrap the stitch, but the thick/thin part when hooking over confuses me. I’m not sure which is the thick part, and which is the thin. Would you explain that a little more? Thanks. On the first 3 stitches and last 3 stitches (after weaving) you will have 3 loops on each. You want to look at the weaving and see if the extra loop is from the over lapping. If it is, then it is your thick side and you lift one and leave 2 loops on the needle. If not, it’s the thin side, lift the 2 bottom loops over the top loop to leave it thin. When you do the next row of weaving, you will again do an overlapp on some of the first and last needles creating the 3 loops. So that you will always end up with the 3 loops, it’s important to leave 2 on some and 1 on the others. Okay–I’ll play with it a little more and let you know how it goes. Well, the light bulb has finally come on!!!! Thanks for the help. Ok I don’t understand this stitch at all.I don’t understand that thick and thin parts, and sometimes I wind up with 4 wraps on one, instead of 3, and I don’t know if the angle is suppose to be different with each row. I just can’t seem to get the hang of it I guess. I had a problem with this stitch at first, ripped it out 5 times before I got it right!Then while watching the video, when Pat turned the board around and said to watch which direction the yarn was coming from, then I got it to zig zag. At first it was just straight, couldn’t figure out why I couldn’t get the yarn to wrap in the other direction.Now its one of my favorite stitches,so nice and thick! It took me a while to figure out which was thick and which was thin – finally realized it has to do with how many wraps are at the top of the needle – if the 2 wraps are at the top – it is thick and if 2 wraps at the bottom , then it is thin – and then you pull over accordingly. One more comment about this stitch – i used it to make a bag – it turned out nice – but it has a border all around it in stockinette – was this supposed to happen – it looks okay – does not dtract from it – i just thought it was weird that it did that. i just bought an 18″ knitting board and it is so difficult to use. it is so hard to lift the loop over the top and to start where you zig zap, skip one peg, turn and then zig zag back. The needles are so small and there is no groove for easy removal of the first loop. I tried doing the figure 8 wrap like I do on my knifty knitter and it was hard too. I watched many videos and it looks so easy but it really is not. Is there any tips on how to make it easier. I even marked every other peg to help me skip a peg too. too complicated to use. wondering why the following stitches are unavailable on your website listed under “stitches” :rib, stockinette, open rib? I have recently purchased a sockloom and I just cannot seem to get the hang of it. I have tried different yarns and have watched several videos. 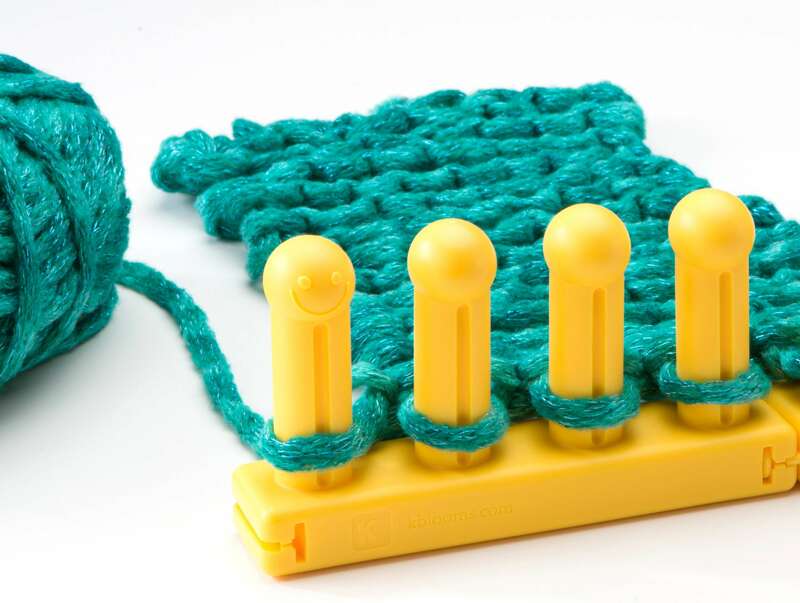 It seems very tight and difficult to pull the yarn over the pegs, I have popped my yarn several times. I don’t want to give up. I know I must be doing something wrong, but what. please help. This should take you through each step. I am also having trouble with the Zig Zag Stitch. On the CD I can’t see how you are weaving the pattern on the knitting board. I wish the camera man/woman would have zoomed in closer when you were weaving the 3 stitches on the board in the begining and at the end. Just got the knitting board and sock loom a week ago. Love the board. I am unable to get the zigzag stitch right, I seem to get 4 wraps around soMe needles….tried several times but have failed. Please help ,I would be very grateful. Hi! I just starting knitting on the long loom and I just can’t figure out this zig zag stitch. I am fine with the first 2 rows but then everything goes wrong. (I should mention that I have never knitted before) I end up with 4 loops every time! Do I knit every row the same as the first row? Should I double back on the last 3 pegs every time? Will only the top 3 pegs keep 2 loops or will there always be 2 loops on the top and bottom? I looked at the link but that just shows me photo’s of the first 2 rows. Is there not a youtube video that goes into more details – more rows? PLEASE HELP!!! Thank you! I finally got it right! 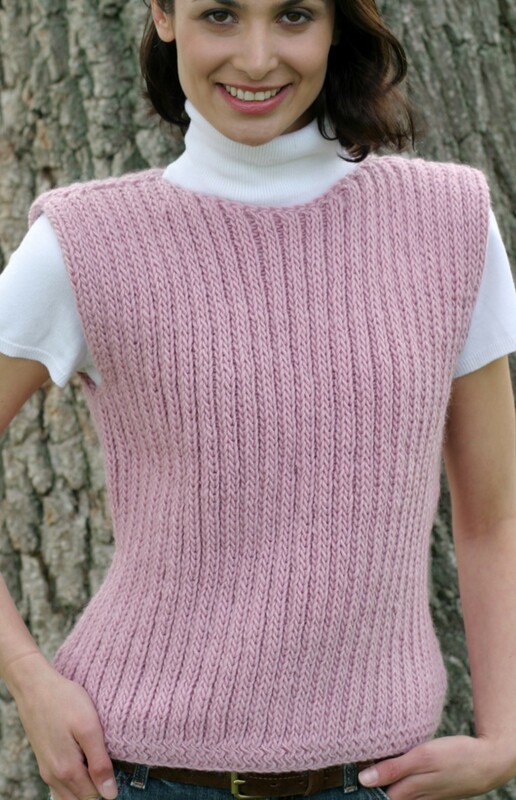 I downloaded the pattern for the Ribbed Vest but I’m stuck at the neckline shaping. I don’t have a clue! Can you please explain it in “dummy” terms? I read the pattern a million times last night and I think I got the arm shaping wrong as well. There are 4 steps for shaping the arm, requiring me to decrease 1 stich each end. Here’s what I did…I am knitting on double, so I moved my loop of my 1st peg on back board to the 2nd 1 on the back and the 1st loop of the front board to the 2nd 1 on the front, and I did the same on the end of my loom. I did this the 4 times. I now think it was the wrong way. If you say decrease I stitch, do you mean only move 1 loop of 1 peg? On the front board or the back? 1. ” Starting at back end, bind off centre (12) stiches.” Do I bind of 12 stiches or is the centre stitch peg 12? How many stitches (back & front board) do I bind off? 2. “Pick up 2 loops of first centre stitch and 1 loop of next stitch.” I have only 1 loop on each peg so I have no clue. As you can probably tell I am totally lost! I’ve combed the internet for information on how to shape a neckline but couldn’t find anything. You are my last hope before I totally give up.